Beta 2 is out and can be downloaded here. Flickr set of screenshots highlights some of the new features. So far I’m impressed. This marks one of the biggest changes to Office in years. New is the ribbon at the top of the screen for easy access to features that are required for the currently selected task. In the brief play tonight it felt far more intuitive than Office 2003 – a real step forward. The ribbon will be a love it or hate it feature – those that are used to Office as it stands today may feel uncomfortable with the change. Excel has had the 64000 row limit removed and the chart formatting options are quicker and slicker than before. Table handling has advanced and data can be more easily manipulated. Outlook has seen very little change although the searching (once you download a beta of Desktop Search) is now more integrated with the product. The rest of the apps see the ribbon applied and easier to use themes although Visio hasn’t had the same makeover as other apps – new functionality is available but no ribbon. One snag is I haven’t been able to activate easily – hopefully this will be sorted over the coming days. Looking forward to seeing how open the new file formats are and if Access has changed much since I last used it in anger. What’s new in Powerpoint ? Actually, Word, Excel, PowerPoint and even Outlook emails use the new Office Theme technology to style all the content in the document. 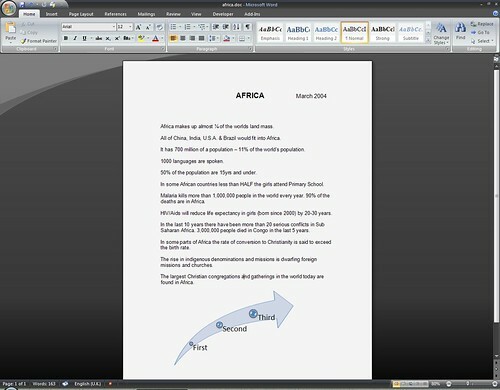 So, everything you type or insert into your document matches the document effortlessly. Everything in the document i based on a design that was hand tweaked by visual designers. It’s super easy to create great looking docs. And themes are really easy to customize so your document looks unique. You can tweak the colors, fonts and graphic effects. PowerPoint, specifically, now creates stunning slides easily. Get Beta2, apply one of the new themes, create a slide with a chart compare that to what you can do in the last version. Big difference. Hope you enjoy it. We’ve been working hard on it for you. The theme functionality was noticable throughout the apps (even Visio if I remember correctly) although I didn’t spot it in Outlook. The big difference for me wasn’t Powerpoint but Excel – the charts it produced were great and it was very easy to change the look and feel of a series of charts while keeping them all consistent – something that wasn’t easy to do in previous versions. I’ve updated the post to link to my Flickr set of screenshots.